It's one of those unwanted and thankfully quite rare side effects of wearing makeup and using skincare; allergic reactions. I have only had a flare up from moisturisers twice (and always day moisturisers) and unfortunately I'm right in the middle of the second. Often times an allergic reaction is completely unexpected and because of a seemingly innocuous product that everyone seems to use without any problem. It can often leave us feeling self conscious and unsure of what to do to make it better. Here is how I deal with allergic reactions. First of all, I worked as a pharmacy assistant for over 5 years so I have seen a lot of allergic reaction and know all the over the counter products that can help. I am not a doctor or a dermatolagist but for most fairly minor skin allergies, the remedy is the same and quite simple so you generally don't need to go to a doctor. If you are unsure, chat to your pharmacist. They can take a look at your skin and tell you if it is just a simple reaction or something more serious that you should go to the doctor for. What I am recommending is definitely for more simpler reactions but it is a proven remedy that will get your skin back to normal as quickly as possible. Well it can vary and it can also be a little hard to identify at first. Even with all my experience and training as a pharmacy assistant I failed to identify my first allergic reaction to a new cream until it was quite far gone. I was in Europe and my normal moisturisers weren't cutting it in the sub zero winds so I bought a new one. When I started using it, around my chin got very dry and looked a lot like windburn so my bright idea was more moisturiser! Bad move, trust me. When I get an allergic reaction it starts as dry bumpy skin on my chin and then goes up to my cheeks and brow bone and spreads out from there. Allergic reactions can also present as hives (like lots of mosquito bite bumps), peeling, breakouts or even just a red, dry or itchy skin. Stop using it! It's a no brainer but try to figure out what has set you off. Most of the time it is something new or different but always bear in mind that you can develop an allergy to a product you have used before with no problems. It you are having trouble identifying what has set you off stop using everything and reintroduce things gradually and you should get an idea from the timing which one is giving you a reaction. Also, now that I have had a reaction to two different moisturisers I can go through the ingredients list and see what shared ingredient might be setting me off. I know it can be really hard if you are feeling self conscious but the best thing when your skin is going through a bad phase is to let it breathe, so if you can avoid wearing makeup things will heal up a lot faster. Also, even if your skin feels rough and dry avoid the temptation to exfoliate or use every skincare product in your arsenal to fix it. Over cleansing, exfoliating or otherwise messing with your skin has a very good chance of just making things worse. Your skin knows what it is doing so just leave it to its devices and it will heal things up on its own. Of course you will still need to cleanse and moisturise but just use products that are as simple and gentle as possible. Avoid anything for oily or acne prone skin because they have drying agents (usually salicylic acid and alcohol) which will just make things worse. I used the brand Avéne when I had my really bad reaction and it was amazing and so gentle but it can be a little expensive so just find something gentle and simple within your budget. There is nothing wrong with good old sorbelene cream! There are a couple of over the counter remedies that can really help reduce redness, itchiness and general discomfort while also healing it up much faster. First up is antihistamines! On a super basic level, an allergic reaction is where your body mistakes something harmless as a threat and releases histamines as an inflammatory immune response; histamines are what make you red, puffy and itchy and antihistamines combat that effect. I have always preferred Zyrtec, especially for skin allergies. It is non-drowsy, fast acting and really helps with the itchiness and inflammation. Just follow the directions on the packet or from your pharmacist (usually one tablet a day until the reaction is all cleared up). Finally, you can get an over the counter steroid cream that will heal up your skin way faster than on its own. Steroid creams are the go to treatment for pretty much every skin inflammation for allergies to eczema and psoriasis. Don't be afraid of the word steroid either. The over the counter formulations are very effective while still being very gentle as long as they are used for short periods as directed. 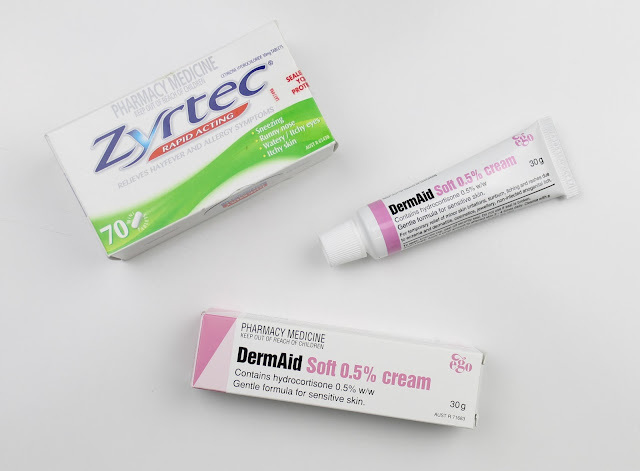 I recommend the Dermaid Soft 0.5% cream which you can get at any pharmacy (they keep it behind the counter) and I have used it many times. It also comes in a 1% strength but if you are using it on your face and other sensitive areas it's best to go with the lesser strength. Just follow the directions (usually to apply 2-3 times a day) and you will notice a very fast recovery. If you have an allergic reaction and follow all of these steps you will find your face back to normal before you know it. Even with the severe reaction I had in Europe, my skin was totally better within a week because I just left off the makeup and let my skin heal. The reaction I have at the moment was more minor because I noticed it earlier and it has almost completely healed in about 3 days. Just be patient with your skin and let it recover and you will be back to your fresh faced self in no time. Remember, you can also always ask your pharmacist and they will be able to help you out with skin concerns or let you know if you should go to the doctor instead.